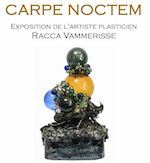 From 25 March to 27 April, an exhibition by former student of ESAP Pavillon Bosio, Racca Vammerisse. Visitors can order copies of "Nuit Obscure de l'Ame", by Laurent de Verneuil, about the artist's work. For more information phone +377 93 15 29 40 and visit the venue website at: Mediatheque de Monaco - Programmation.